Like PFF Fantasy quarterback and tight end rankings, wide receiver has a unanimous choice at the top in fantasy football — Antonio Brown. It’s much deserved after five dominant years where if you did a slash line of just the minimums from the last five years, his would be 101 receptions for 1,284 yards and eight touchdowns. But the next three receivers have a claim to the second spot, at least according to our rankers. 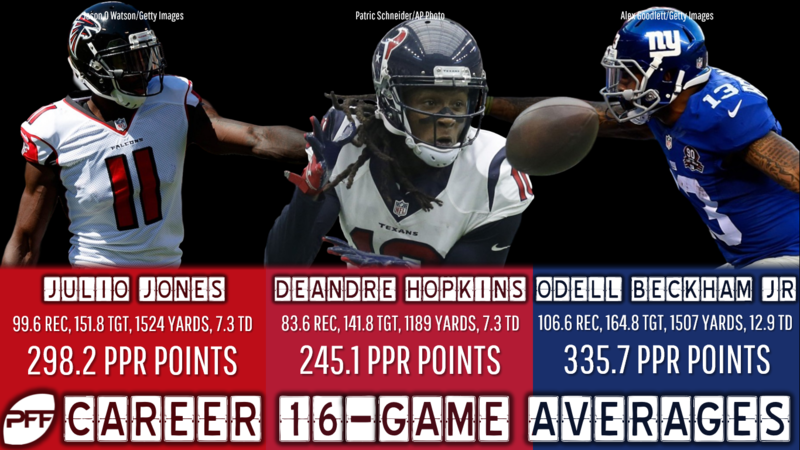 DeAndre Hopkins, Julio Jones, and Odell Beckham Jr. are all ranked either second, third, or fourth in some order, while no other receiver cracked the top-four. But which one to choose after the inevitable selection of Antonio Brown? We know what all three are capable of. with each topping well over 100 receptions or 1,400 yards or double-digit touchdowns in a season at multiple times in their career. We’ll start with Hopkins, who had quite the bounceback in 2017. After failing to top 1,000 yards in 2016, he stormed back with 96 receptions for 1,378 yards and a career-high 13 touchdowns to finish as fantasy’s top receiver last year. Hopkins had turned in great fantasy seasons before, setting career-highs in 2015 with 111 receptions and 1,521 yards, so it wasn’t out of left field. But as far as efficiency, Hopkins really cranked it up, finishing fourth among all receivers (with 50 targets) in yards per route run after never finishing better than 10th. Perhaps the best comp to Brown of the three, at least when it comes to consistency, is Jones. Not only has he averaged over 100 receptions in each of the last four seasons, but he’s totaled a minimum of 1,409 yards in each of them. And if you thought Hopkins’ yards-per-route-run finish was impressive, keep in mind Jones was first on the list last year. And the year before that. And the year before that. And two years before that. Yes, Jones has been tops in YPRR in four of the last five seasons. Talk about efficient. If there’s one knock on him, it’s his scoring. During this four-year stretch, he’s averaged only six touchdowns per season, which is nothing compared to contestant No. 3.